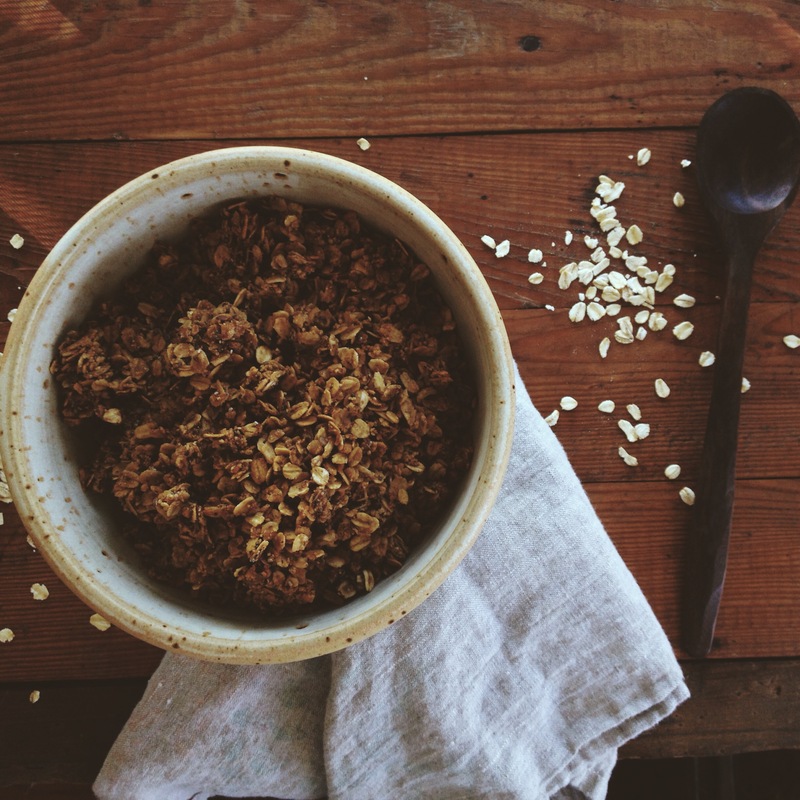 I have been mulling over the thought of granola for days. A silly thing to be thinking about really. The notion to make some came into my head and it lingered, gently, until the urge really hit me. Obviously I should have known it was going to. I should have been better prepared. I picked up some oats earlier in the day (just in case I needed them some time soon). Oats are not something I typically pick up just in case. Cheese, nuts, seeds, coconut, olives, lentils, chickpeas. Those are the kinds of things I pick up just in case. 9 pm hit and an hour drive from any sort of organic/natural grocery store (and I had already been to two earlier in the day). But I was in the mood to forget the taxes that needed to be paid and my list of things that needed to be done that night and escape by cooking, baking, making…particularly granola. However, I did not have two of my favorite ingredients: hazelnuts and shaved coconut. Nor did I have nuts of any kind or any form of coconut for that matter. Two essentials for granola in my opinion. My pantry shelf is pretty much at its bare minimal. Mostly spices and different forms of sugar. And oils. And vinegars. But there was just enough. Enough to mix together and make a rather good base. Toasted coconut and nuts can always be added at a later time. When actually using the granola to top fruit or yogurt or however I deem to eat it at that moment. This is an adaptation of an adaptation. My go to granola was originally adapted from one of my good friend’s recipes and is an excellent base for whatever you would want to add. Whatever flavors you prefer in your granola. Hmm…if I had been thinking I might have tried throwing in some rosemary. But I wasn’t thinking. My brain was wanting something brainless. Something that I did not have to concentrate on. I didn’t want to think. I just wanted to get lost in the making. In the measuring and stirring and the ease of making something by rote memory. I wasn’t wanting to create. To experiment. I wanted guaranteed success. I wanted familiar. Something I knew. Preheat oven to 325. Lightly oil rimmed baking sheet. Combine oats, flour, flax seed, chia seed, sugar, cinnamon, and salt in bowl. Set aside. In a small saucepan over low heat, stir honey, oil, milk, and vanilla until mixture fizzes and just begins to simmer. Pour over oat mixture and coat well. Spread out on baking sheet. Bake for 25 minutes until lightly browned, stirring often. Let cool on baking sheet on wire rack for 1 ½ hours undisturbed. Break up and store. (I like to keep it in the freezer.) Makes a little over 4 cups. Remember way back when we had a shop and sold @mastbrothers baking bars and I would make these chocolate hazelnut biscotti to serve you when you stopped by the store? Well, just posted the recipe over at @lvr_naturals. On the journal portion of the site. Perfect right before Christmas. Because biscotti is definitely a Christmas cookie.